Note: This is a slightly rewritten version of a review from a screening at the London Film Festival 2017, published here to tie in with my review of Luca Guadagnino’s remake. While he continues to dilute his legacy with garbage like Giallo and Dracula 3D (and the rest of the last two decades), it’s a fine time to be reminded that, at one time, Dario Argento made some of the most visually stunning horror cinema ever seen. Suspiria, recoloured to its intended luridness and remastered in 4K for its 40th anniversary, is a brutal, beautiful, masterpiece. The paper thin story of Suzy (Jessica Harper), an American ballet dancer, going to a famous dance academy where people begin to disappear and be killed, couldn’t be any less important. This isn’t one of Argento’s many whodunnits, instead he simply wants a framework on which to hang the film’s stunning set design, lighting and its graphic gore. Suspiria’s tagline famously told us that the only thing more terrifying than its last 12 minutes were the first 92. I agree in part. The film’s first 15 minutes or so, up until the first two deaths have been shown, are a self-contained masterwork. The vivid lighting, drenching what should be a drab rainy night in unnatural colour, the striking set design – all sharp lines and symmetry – and the Goblin score; ethereal at first, building to a pounding, sinister, crescendo; all these things combine with the shock of sudden violence in a sequence that envelops us completely in the world of the film. Throughout the film, the use of colour is incredible, but it’s the many shades of red that are most striking, setting the film alongside Powell and Pressburger’s The Red Shoes and Bergman’s Cries and Whispers as one of cinema’s most beautiful and most searingly memorable uses of that colour. The film has moments of ethereal beauty that give way to scares that get under your skin, like the sequence in which the girls all sleep in the school’s gym on camp beds, in which we hear the unnerving sound of the school’s directress. Argento’s use of colour and silhouette here are especially impressive. Equally, Argento shows his mastery of shock, as in the barb wire room sequence, which actually made me jump out of my chair and shout a four letter word the first time I saw it. The scenes in the dance school, with their obvious dubbing and over the top line reads, aren’t the film’s strongest suit. This is something one just has to accept in Italian films of this period, they were shot without sound and that can mean that the acting suffers. That said, in this case the disconnection from reality that dubbing often lends is, intentionally or otherwise, effective in further dislocating us from reality, just as the film does to Suzy. 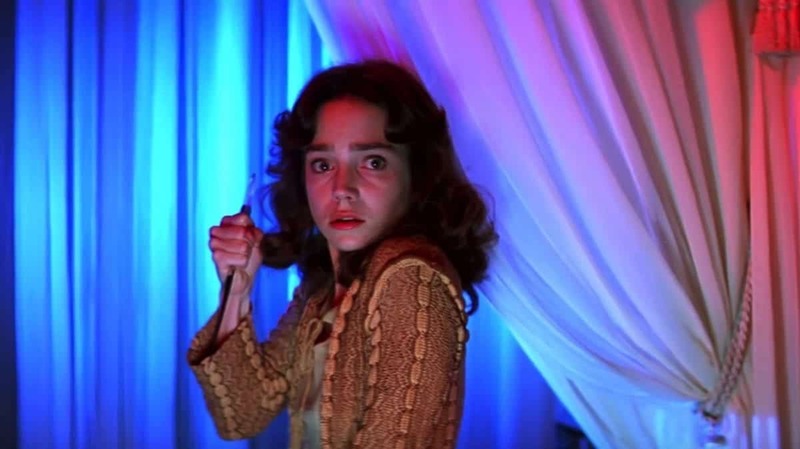 This isn’t to say that the performances don’t work for the film though, Jessica Harper isn’t one of horror cinema’s tougher final girls, but our journey through the world of the film is much like hers – slightly surreal, sometimes unnerving, sometimes confusing – and Harper takes us along on that journey effectively. Most memorable among the supporting cast is Alida Valli, (over)playing strict ballet teacher Miss Tanner to often very funny effect. Argento sprinkles scares, surrealism and beautifully designed slayings throughout the film, but the tagline undersells the film’s last 12 minutes. Suzy’s surreal journey through the ballet school to find the secret at its heart contains some of Argento’s most incredible and iconic visuals, bringing the film to a crescendo. On this viewing, with the picture so vividly remastered and the sound thundering into my ears, I saw Suspiria on a non-narrative level. That’s probably how it works best, as a purely sensory experience; shape, colour and noise colliding into the most beautiful of nightmares.